John Oppermann went to law school knowing he was not going to practice traditional law and aspired to be involved in environmental work. Interested in sustainability, he looked into non profit organizations. After working as a corporate attorney for a short time, he pursued his dream to become the Executive Director of the Earth Day Initiative in NYC. “The focus of the Earth Day Initiative is to connect people with the great work being done around the environment. Our organization’s Earth Day events showcase the broad range of sustainability initiatives from sustainable food companies to environmental conservation campaigns. The idea is that no matter what your interests are, something will resonate with you,” says Oppermann. John has found that most people want to make a positive impact. They want to do something to help however, receiving a long laundry list of what they can do is overwhelming to most. This led the Earth Day Initiative to develop the Do Just 1 Thing Campaign. This call-to-action narrows in on one thing that is simple and has a big impact. This one thing is switching consumers over to solar or wind energy. “Most people feel that their electricity supply is out of their control. But we connect people to resources that allow them to take their electricity into their own hands and support cleaner energy sources,” says John. Earth Day New York 2018 will take place on April 15th in Union Square from 12pm-7pm and is one of the most popular awareness raising events in the country. The annual festival, which is free and open to the public offers visitors easy, actionable ways to make more sustainable and environmentally conscious choices in their everyday lives. Attendees are invited to bring their utility bills to sign up for clean energy at the event as part of their Do Just 1 Thing campaign. 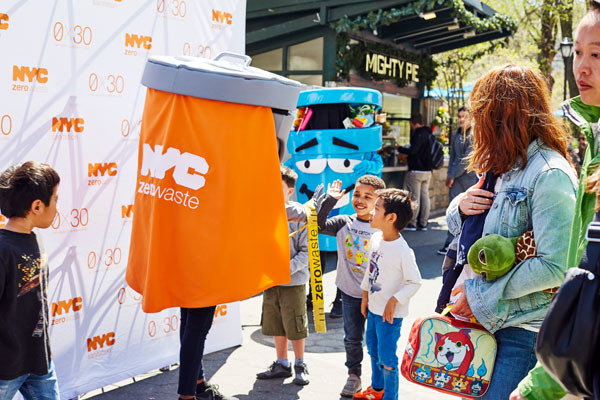 Dozens of exhibitors, including environmental campaigns, green lifestyle products and services, live performances, talks, entertainment and activities for kids and adults alike, clothing and electronics collection for free and recycling by DSNY will all be at this one-day event. Local food and beverage vendors will also be present as well as interactive booths from Innisfree and Cardboard Technologies. The Earth Day Initiative will then host their annual Earth Day 5K Green Tour on Friday, April 20th from 10am-1pm. There New Yorkers and tourists alike are invited to get outside and visit green organizations around the city. The tour will include a living green wall and a Broadway theater that’s going green, among other destinations. It’s a great way to get outside in advance of Earth Day to support great green sites and find out how to get involved, volunteer, and stay connected with green NYC throughout the year. The series of events will cap off with the Earth Day Initiative setting up shop at Grand Bazaar NYC on Earth Day to provide an extra opportunity on the global holiday for New Yorkers to Do Just 1 Thing. For more information please visit www.earthdayinitiative.org.